During his lifetime he won four Oscars – but many will remember him attempting to perform Grieg’s piano concerto with Morecambe and Wise. He was the legendary conductor of the London Symphony Orchestra who was married five times. The jazz singer, Betty Bennett, became his first wife; the couple quickly had two daughters and, just as swiftly, split. A few years later, the lyricist Dory Langan became his second wife and song-writing partner. Together they wrote Oscar-nominated numbers for the films Pepe (1960) and Two For the Seesaw (1962). He won Academy Awards for the musicals Gigi and Porgy and Bess. And for the scores to Irma La Douce and My Fair Lady. One of his more famous marriages was to actress and activist Mia Farrow, a movie star and former wife of Frank Sinatra, with whom Previn had three biological children. They also adopted three other children, including Soon-Yi, who went on to marry Woody Allen, Farrow’s partner – after her break-up with Previn. Previn later married Heather Mary Hales, and they divorced 17 years later. His final marriage, in 2002, was to the violinist Anne-Sophie Mutter, whose musical ability he greatly admired. The couple lived in Germany – the land of his birth – but divorced after 6 years. He was the one of the most talented all-round musicians of the twentieth century; a household name rarely off television sets in the 1970s. He became well known on British television with a series called Music Night – in which he played and conducted classical pieces and introduced a range of musical guests. But nothing compared with Morecambe and Wise. Their Christmas shows were a British institution and regularly watched by more than twenty-five million people. Dory Langdon became André Previn’s second wife and song-writing partner. In 1971, Previn was invited to perform in a sketch which involved an orchestra: the serious minded maestro playing straight man to Eric and Ern. His tight schedule meant they couldn’t rehearse, so Previn learned his lines on the way from the airport in the back of a taxi – arriving with one condition: they could make as much fun of him as they liked but they were not to mock the music. “If anyone thinks we are trying to be funny, we’re finished,” explained Eric. “We have to act as though it is very serious.” The great composer had the good sense to listen. Previn married the American movie star, Mia Farrow, and the couple had 6 children – 3 of whom were adopted from Vietnam and Korea. They lived in Sussex during Previn’s time at the London Symphony Orchestra. Morecambe played an inept soloist – booked to play Grieg’s piano concerto as a late replacement in for Yehudi Menuhin. 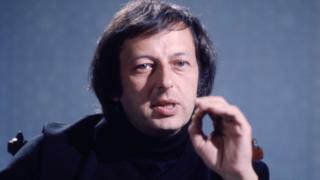 With a flourish, he introduced Previn as “Mr Andrew Preview” and treated the orchestra with customary disdain. “Not too heavy on the banjos,” instructed Morecambe before hopelessly failing to hit his cue. He insisted the bemused conductor leap in the air so he could see him over the piano lid and then turned in such a bizarrely jaunty version of the music that Previn exploded. If Previn had smirked and cracked a smile, the sketch would have been ruined. Eric had been right: the key was to play it with deadly earnest – no easy task with the audience in stitches. André deadpanned himself to comic glory and Morecambe & Wise’s biographer described the show as their finest hour. All the wrong notes. As Eric Morecambe explained, the key was to play the sketch as if they were deadly serious. “If they think we’re trying to be funny,” he said, “we’re finished”. Previn never cracked a smile. Previn kept up a hectic schedule of live performances well into his eighties. He tried his hand at opera, with versions of A Streetcar Named Desire and Brief Encounter – to mixed reviews. The London Symphony Orchestra released a statement to say they were “deeply saddened” to hear of his death. Kathryn McDowell, managing director of the LSO, said: “André Previn is a hugely important part of the LSO story, long before LSO Discovery was established André Previn was reaching out to new audiences far and wide through television. The Pacific Symphony also paid respects to the “great pianist and conductor”. R&B singer, Dionne Warwick thanked the composer for writing the theme song for Valley of Dolls, as well as other “amazing scores for film”.